What is the best photo beautifier for portrait? WidsMob Portrait has the full makeup control that intelligently detects and beautifies each aspect of a portrait image. Comprehensive and intuitive controls over face, eye, cheek, noise, teeth, shine, skin and more makeup aspects. The portrait retouching software also provides one click for blemishes removal and pouch removal. It has a sophisticated management system to improve skin texture. Besides smoothing, wrinkle removal and skin whiten, WidsMob Portrait also enables people of different colors adjust skin color tone according to their own requirements with an advanced algorithm. It just detects all portraits within the same image, which you can adjust each of them with different solutions. What is more important, WidsMob Portrait has the customize option to define presets with combined effects, which you can achieve the result within one click. And it support photo beautify for both the JPEG and RAW format. Whether you take portrait images with DSLR or smartphone, you can redefine portrait retouch without any further upgrade. Of course, it also exports the portrait images to high quality files. 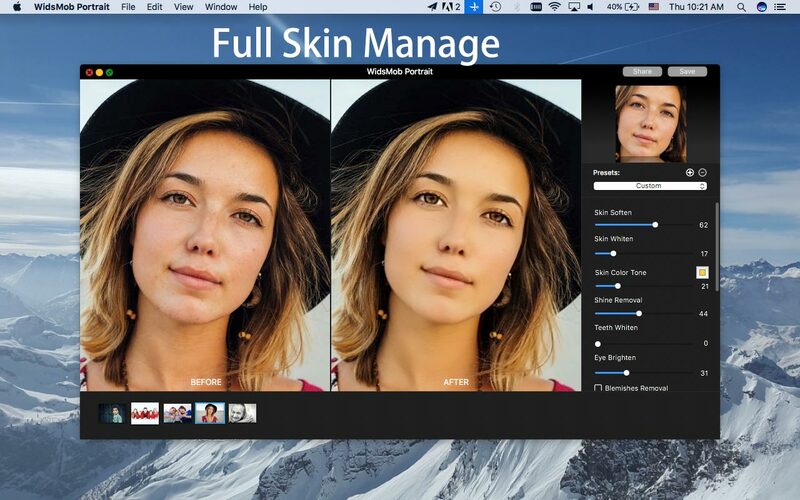 It has an intuitive interface to retouch portrait images. What you need to do is adjusting the parameters to get the desired results. You can directly preview the effects with the Before And After Mode. The excellent algorithm provides the wonderful effects in 4X speed.